Official LG G5 case confirms a G5 SE variant, suggests beefier specs? Last week, it was discovered that LG, despite its outspoken criticism of iPhone SE, had trademarked the 'LG G5 SE' name as early as mid-February—when Apple's new phone was still technically a rumor. We found this to be rather chuckle-worthy, but didn't want to read too much into it given how it could just be some maneuver intended to protect the company's brand. Still, the filings raised the possibility that LG, too, is working on a smaller variant of its flagship, just as it has done in the past. It would appear that's only halfway right. 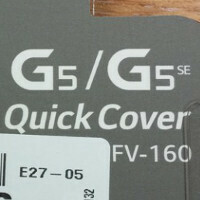 Official LG G5 Quick Cover case packaging, obtained by MobileFun, has been spotted listing compatibility with both the LG G5 and a mysterious LG G5 SE device. We're not talking about fine print, either—the label is quite prominent—making it unlikely that this is an oversight on LG's part. But this raises an entirely different question. Whereas the iPhone SE is a smaller iPhone 6s donned in iPhone 5s clothes, the LG G5 SE has got to be identical in dimensions to the LG G5 we all know, otherwise the Quick Cover case in question won't fit. This suggests that instead of downsizing, LG may be, in fact, planning on an even beefier, special edition of the G5, which may come with better hardware, or some other extra entirely. Truth be told, however, we've heard nothing on the matter so far—not even a beep. We've reached out, requesting a comment from LG, but in the mean time, we'll be keeping our ear to the ground. Waited too long for a decent small android device, tried phablets and I guess I like them more. I don't think this one will be small, the case is supposed to fit both variants. Is it a proof that the original G5 is DOA. Why would they want to rush an improved model in quick succession? I'd expect a light version more than a "beefier"
It will be a less powerful version for the emerging markets. Who said it is rushed. No one knows how long they have been working on it. The reason simple . Perhaps the fear of S7 so maybe it means SE Special Edition with a different look and maybe something more needs to be water resistant. And better Battery. PS: Please do not take this koment 100 % true. it's just my guess. Now that would be a nice looking phone. That's way it should be done. https://youtu.be/8IvH4SAX1Xw?t=300 LG G5 SE on video! Well that was my risky click of the day, but yeah Droid life was apparently given a G5se as a review unit. It's probably a cheaper version of the G5 with 720p screen and a 650 or something. Smart move keeping the dimensions the same, it would allows the G5 SE to play with the G5 friends family. The cheaper G3 was the same size as the G3 right? main camera sensor for the G5 is the same damn sensor as the G4. WHY??? ?